It is no secret that the SEO (SEO) rules have changed significantly in recent years. One important aspect, however, is usually paid too little attention: the fact that the key to a successful SEO strategy is no longer in keywords today. A purely keyword-based approach is not only cumbersome in implementation, but also outdated and ineffective. The reason for this lies in the changed search behavior of users: Instead of cryptic terms, these now usually enter longer, fully-formulated search queries. And the algorithms of the search engines were adapted to this new search behavior. For you, this means having to consider these new circumstances when structuring your website and creating content, and that in turn requires a new SEO strategy..
What is an effective SEO strategy? If you want to successfully search engine optimization today, you have to take into account the change from a keyword-based to a topic-based search. Thus, the focus shifts to cover topics comprehensively and to achieve with individual pages good rankings for longtail keywords. You can do this by restructuring your website and creating so-called topic clusters. This means that you first structure your website according to different core topics and subordinate them to more specific subtopics. Your core topics will match your keywords and sub-topics will be your long-tail keywords. So let’s look at how you can optimize your SEO strategy in just eight easy steps. While keywords still play an important role in SEO, modern SEO strategies focus on topics – keywords come into play later. So your first step is to find topics that are relevant to you and your audience. The best way to do that is to create a list of about 10 short terms that match your products or services. You then use a keyword tool, such as the Google Ads Keyword Planner , to check how often users search for these terms. The tool also helps you to find meaningful variants of these keywords for you. Keep in mind that this step is to find out which keywords are being searched for topics that are relevant to you – and NOT to find topics for your blog posts. Because keywords that you identify in this way are extremely popular, which is why it would be difficult to achieve good rankings with individual posts. This is especially true if you are just beginning to optimize your website for search engines. Then select about 10 to 15 keywords (topics) for which you want to (and should) rank well, and rank them by priority or relevance. Each of these keywords is one of your core topics that you use to structure your website. Pages that cover these core topics are called Pillar pages. Each pillar page forms a topic cluster along with the cluster content grouped around it (subpages dedicated to long tail keywords). These subtopics are now to be determined in the next step. At this point, optimizing your website for specific (long-tail) keywords comes into play. Use a keyword tool to identify about five to ten long-tail keywords for each of your core topics, each representing an aspect of its core topic. An example to illustrate: Suppose “SEO” is one of your core topics. Then your goal would not be to get a good ranking for this keyword. Given its popularity, this would be an extremely difficult undertaking. In addition, if you optimize multiple subpages for the same keyword, you risk having your own posts compete in terms of ranking. To improve your SEO keyword ranking, you would choose this topic instead and create a Pillar page. This would then subordinate you to various blog posts on more specific topics, such as keyword research, optimization of graphic elements for search engines, development of an effective SEO strategy and similar relevant sub-topics. You can also find out which sub-topics are available for blog posts on a specific core topic using a keyword tool . At this point, you should have determined five to ten sub-topics for each of the core topics defined in the first step. As you can see, theme clusters are basically about helping search engines capture your content. And the closer you go to a specific aspect of a general topic on a subpage, the better this page is rated by the search engine algorithms. Also, keep in mind that it makes sense to highlight specific aspects of a topic as far as lead generation is concerned. Because the more targeted users search for information, the more specific are their requirements and the more likely these visitors become leads. In the next step, for each of the core topics identified in the first step, you will create one webpage each (a pillar page) to give your readers a comprehensive overview of the subject. Mention briefly the associated long-tail keywords that you set in step # 2. So in our example from above, here’s a brief introduction to SEO, with a brief look at keyword research, optimization of graphic elements, SEO strategy development, and more. You can think of a Pillar page as a table of contents in which you can tell your readers what content you’ll cover in your blog posts. When choosing the number of Pillar sites, you can be guided by the scope of your product or service offering or the number of locations you have. It is all about covering the individual needs of your company as comprehensively as possible. This will help your prospects and customers find your content easier, even if their search queries do not exactly match the keywords for which you’ve optimized your content. When creating your content, be sure to only choose content that is relevant to your prospects and potential customers . Optimize the user experience by adding graphic elements and linking to other relevant content on your website. How to set these links, you will learn in the next step. Blogging can be a very effective way to improve your keyword rankings and increase your website traffic. The more posts you publish, the higher the likelihood that one of your articles will appear in the search results. It is worthwhile in any case to run a corporate blog. Keep in mind that only in the blog posts do you actually enter into the information that users – and thus search engines – are looking for. Mention long tail keywords a maximum of three or four times per post. Because overloading your articles with keywords risks being punished by search engines for keyword stuffing. Include links in your posts that refer back to the parent Pillar page . To do this, you can either integrate hyperlinks into your continuous texts or set the appropriate tags in your Content Management System (CMS). Then add links to the child posts to your Pillar pages . It is best to place the links in places where you introduce the topics covered in the linked blog posts. By linking your Pillar pages and your cluster content in this way, you’ll show web crawlers that there is a connection between the linked long tail keywords and the parent topic. Not all blog posts and subpages need to be part of a theme cluster. The main thing is that you handle topics that interest your target audience, even if they are marginal issues. Because the more popular your content is, the higher the authority of your website, and the better the ranking of other content outside the cluster model. For companies, it is therefore recommended to publish at least one blog post per week. But do not be tempted to plan your contributions primarily with regard to the search engines, but orient yourself primarily to the needs of your target group. Focusing on topics that interest your readers and prospects, and then incorporating relevant keywords into those posts, will automatically build a loyal audience and authority. Before you begin to create your contributions, you should first consider which topics you should prioritize according to your corporate goals. It’s best to create a list of all topics, rank them by relevance, and then plan your posts accordingly. Keep this list up-to-date, check which items are most effective in reaching your business goals, and prioritize them. 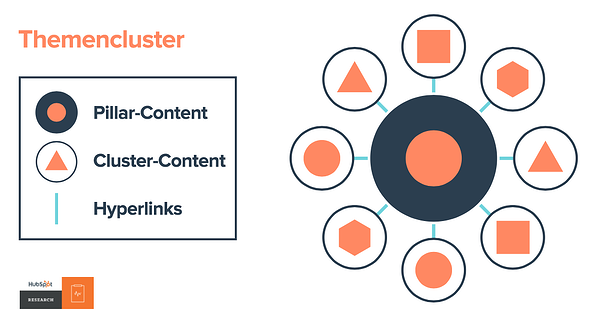 While introducing the theme cluster model is currently the best way to improve your content rankings, your options are not exhausted. In steps 1 through 5, we focused exclusively on on-page SEO tactics . But there is another, extremely effective way to improve the ranking of your content: Off-page SEO. This is basically the construction of backlinks, the so-called link building. Backlinks, also known as inbound links or inbound links, are links that point from external websites to your own pages. The value of these links lies in the fact that the authority that search engines assign to specific websites can be transferred to other sites. Ie. that your website can benefit from the authority of the websites that point to it. In general, the higher the authority of the external site, the more it affects the ranking of the linked site. So your goal is to make sure your content links to external pages as often as possible. There are various options open to you. For example, you might agree with other companies in your area that you refer to each other’s content. You can post blog posts and share them on Twitter, Facebook, Google+ and LinkedIn. In addition, you can post guest contributions to other blogs and return them to your own website. In addition, blog posts on recent events or events are great for increasing your backlinks. Because with a little luck, influential industry experts or other bloggers will come across your articles and link them in their own contributions. As the rules of search engine optimization keep changing, it’s not always easy to stay up to date. Fortunately, there are some online resources that are specifically dedicated to current SEO trends and inform you as to whether and what adjustments to your website and SEO strategy would be worthwhile. Optimizing content for search engines can cost a lot of time and energy. So make sure your efforts are paying off and capture and analyze the results of your SEO efforts. There are a number of key figures available that you can collect daily, weekly or monthly. Since search engine optimization is about organic traffic, it’s best to use a tool like SEMrush , which allows you to keep track of your organic traffic, but at the same time, you can specifically look at which ranking individual pages are targeting for specific long tail keywords. Record your results monthly in an Excel or Google spreadsheet or web analytics tool, so you always have an idea of ​​how much organic traffic your site generates. In addition, as you capture metrics on indexed pages, leads, backlinks, keywords, search engine rankings, and the ROI of your actions, you can more accurately determine how you can better target your rankings.